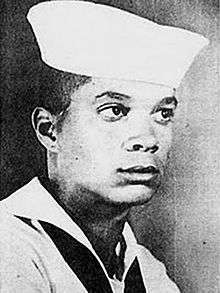 Official image of Sammy Younge Jr. as an enlisted member in the United States Navy. Samuel "Sammy" Leamon Younge Jr. (November 17, 1944 – January 3, 1966) was a civil rights and voting rights activist who was murdered for trying to desegregate a "whites only" restroom. Younge was an enlisted service member in the United States Navy, where he served for two years before being medically discharged. Younge was an active member of the Student Nonviolent Coordinating Committee (SNCC) and a leader of the Tuskegee Institute Advancement League. Younge was the first African-American university student to be murdered in the United States due to his actions in support of the Civil Rights Movement. Three days after his death, SNCC became the first civil rights organization in the United States to oppose the Vietnam War, partly on the grounds that like Younge, innocent civilians should not face deadly violence. Younge was born on November 17, 1944, in Tuskegee, Alabama. His father, Samuel Younge Sr., was an occupational therapist, and his mother was a local schoolteacher. From the age of 12 to 14, from 1956 to 1958, Younge attended Cornwall Academy, in Massachusetts. He graduated from Tuskegee Institute High School in 1962, after which he joined the United States Navy. Younge served in the United States Navy from 1962 until July 1964, when he was given a medical discharge as a result of having to have one of his kidneys removed. Upon his discharge from the Navy, Younge began attending the Tuskegee Institute, in 1965, as a political science student. Younge became involved in the Civil Rights Movement during his first semester at the Tuskegee Institute. After joining a Selma to Montgomery protest march in Montgomery, Alabama, against the "Bloody Sunday" incident in March 1965, he soon joined the Tuskegee Institute for Advancement League (TIAL) — a local civil rights student group formed with the help of the SNCC — and the SNCC. He soon started helping to lead protests by the organizations against civil rights infractions in Alabama. Then, in April 1965, he went to Mississippi and worked with Unita Blackwell and Fannie Lou Hamer to help the Mississippi Freedom Democratic Party get black voters registered. In the Summer of 1965, Younge lead Tuskegee Institute students in challenging overt discrimination in Tuskegee. The group attempted to enter white restaurants, held rallies, and picketed establishments that refused to hire black people. Several times they attempted to attend segregated white churches and were brutally beaten twice. In September 1965, Younge was arrested and jailed after attempting to drive a group of African-Americans to get registered to vote in Lee County, Alabama. Younge continued his efforts to get blacks registered to vote in Macon County, Alabama four months after being released from jail, up until his death. Younge was shot in the back of the head by Marvin Segrest, a white gas station attendant at a Standard Oil station in Tuskegee, Alabama, on January 3, 1966. The shooting came after a verbal altercation between Younge and the attendant about Younge using the "whites-only" bathroom. 1 2 3 4 5 Bourlin, Olga. "Younge, Samuel ("Sammy") Leamon Jr. (1944–1966)". BlackPast.org. Retrieved 7 March 2015. 1 2 Belafonte, Harry (26 February 1966). "Harry Belafonte voices plea". The Afro American. New York. p. 4. Retrieved 8 March 2015. ↑ "Veterans of the Civil Rights Movement Veterans -- Sammy Younge". Civil Rights Movement Veterans. Retrieved 7 March 2015. 1 2 "Murdered: Sammy Younge" (PDF) (Press release). Student Nonviolent Coordinating Committee (SNCC). 4 January 1966. Retrieved 7 March 2015. 1 2 Gale, Mary (8 January 1966). "Killing of Rights Worker Jolts Tuskegee Students" (PDF). The Southern Courier. Tuskegee, Alabama. Retrieved 8 March 2015. 1 2 3 Summerlin, Donnie (2 September 2008). "Samuel Younge Jr.". The Encyclopedia of Alabama. Retrieved 7 March 2015. 1 2 Montgomery, Nancy (9 November 2014). "When the civil rights movement became a casualty of war". Stars and Stripes. Retrieved 7 March 2015. ↑ Clements, Lloyd (21 March 2014). "Letters to the Editor: Younge represented the struggle for black freedom". The Montgomery Advertiser. Retrieved 8 March 2015. 1 2 Foreman, James (1968). Sammy Younge Jr: The First Black College Student to Die in the Black Liberation Movement. Open Hand Pub. ISBN 9780940880139. ↑ "A History of Racial Injustice Timeline: Tuskegee Students March to Protest Murder of SNCC Activist Samuel Younge Jr.". Equal Justice Initiative. Retrieved 8 March 2015. ↑ Hamilton, Charles (1992). Black Power: The Politics of Liberation. New York: Vintage: Random House. p. 139. ISBN 9780679743132. 1 2 3 4 Chandler, D.L. (3 January 2014). "Sammy Younge Killed For Using Whites-Only Bathroom On This Day In 1966". News One. Retrieved 8 March 2015. ↑ "Civil Rights: End of the Facade". Time Magazine. 14 January 1966. Retrieved 9 March 2015. ↑ Haskins, Jim (25 January 1987). "'Sammy Younge Jr.': The despair hasn't faded". Gainesville Sun. pp. 6E. Retrieved 8 March 2015. ↑ "This Week In Black History". New Pittsburgh Courier. 2 January 2014. Retrieved 8 March 2015. ↑ Cobb, William (21 March 2014). "Evolution of an Activist". New York Times. Retrieved 8 March 2015. 1 2 Bullard, Sara (1994). Free at Last: A History of the Civil Rights Movement and Those who Died in the Struggle. Oxford University Press. p. 89. ISBN 0195094506. ↑ "STATEMENT BY THE STUDENT NONVIOLENT COORDINATING COMMITTEE ON THE WAR IN VIETNAM" (Press release). Wisconsin Historical Society. 6 January 1966. Retrieved 8 March 2015.